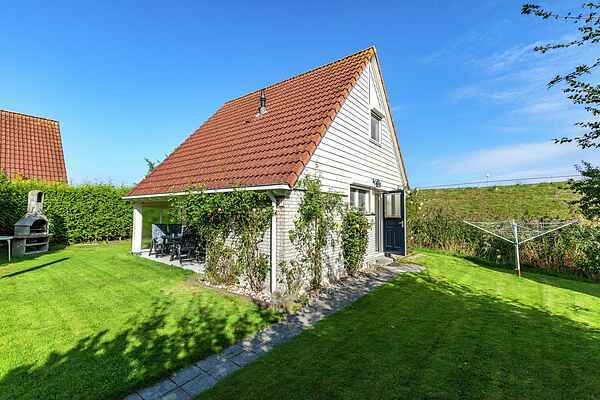 This holiday residence on a small park (without facilities) is hidden away behind the dike of the Lauwersmeer region, in Oostmahorn in Friesland. A perfect location for nature and water sports lovers, and those looking for peace and space. The Lauwersmeer is located only 5 minutes away on foot, and offers possibilities for swimming, surfing, sailing and fishing. The Lauwersmeer Region is a beautiful nature area with many walking and cycling options. Oostmahorn is a small quiet village in the north of Friesland and has a marina, restaurant and cafeteria. You can cross to the Wadden Island of Schiermonnikoog from the village. About 3km away is the town of Anjum, with a few shops and a supermarket. The fortified town of Dokkum (14 km) is certainly worth a visit. In addition to shops and dining options, there are also various historical sights. Options for excursions in the region include the seal nursery in Pieterburen, a ferry crossing to Schiermonnikoog or Ameland, mudflat hiking and visiting the cities of Leeuwarden and Groningen.